One of the provisions of health system reform that is already having an impact on physician practices is the provision on preventive health care services. Read TMA's Health Reform School white paper on prevention to make sure you're ready for this change. The U.S. House of Representatives joined the Senate Nov. 29 in delaying the 23-percent cut in Medicare payments to physicians, just two days before the reduction was to take effect. Starting Jan. 1, families of children ineligible for Supplemental Security Income (SSI) for reasons other than disability can buy in to the state Medicaid Program. Rep.-elect Jose Aliseda (R-Beeville), whose father Jose is a retired anesthesiologist in McAllen. Rep.–elect Sarah Davis (R-Houston), a cancer survivor whose Houston Medical Center district has more physicians and TMA Alliance members than any other in the state. Rep.-elect J.M. Lozano (D-Kingsville), whose father, sister, and brother-in-law are all Texas physicians. Rep.-elect Dan Huberty (R-Kingwood), who defeated two TEXPAC-member physicians in the spring primaries and now has a great working relationship with TMA. Rep.-elect Charles Schwertner, MD (R-Georgetown), a surgeon who will become the fourth TMA member in the legislature next year. (L-R) TMA EVP Lou Goodman, State Rep.-elect J.M. 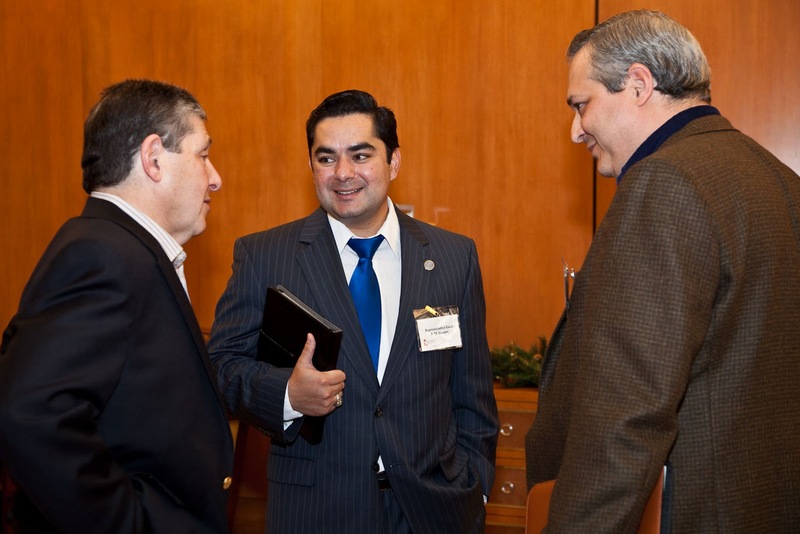 Lozano, and TMA Board Member Carlos Cardenas discuss the upcoming 2011 session of the Texas Legislature. Physicians already fined by the Texas Medical Board (TMB) for not filing death certificates electronically will get their money back, and pending cases will be dismissed because of physicians' problems in registering to use the state's registration system. Blue Cross and Blue Shield of Texas plans to send letters to about 18,000 Texas physicians in 14 specialties informing them of their ratings under its BlueCompare program by the end of the year. The 2010 elections are over, now it's time to get ready for the 2011 sessions of the Texas Legislature and Congress, and the 2012 elections. The federal Office of Inspector General (OIG) has developed a training program to help physicians avoid Medicare or Medicaid fraud and abuse. Texas physicians spent more than their usual amount of time at the microphone today at the interim meeting of the American Medical Association House of Delegates, but they came away with some big victories. The quick-thinking, slow-talking Texans kept AMA out of some potential public relations and membership messes. They also pushed the house to force AMA leadership to articulate the major flaws in the Patient Protection and Affordable Care Act and devise a plan to correct those flaws. The delegates also unanimously approved a Texas resolution asking AMA to support pending federal legislation that would exclude from consumer credit reports, within 30 days, medical debt that has been fully paid or settled. This would motivate patients to pay off their medical debt as quickly as possible. Finally, the house sent the AMA Board of Trustees a Texas resolution asking AMA to take a closer look at turning itself into an organization of organizations instead of an individual-membership association. AMA is losing membership at an unsustainable rate at a time of unprecedented change and upheaval in the American health care system. It’s a time when physicians and patients need the support and strength that comes from the ability of AMA to say it represents the majority of America’s physicians. Congratulations to Erin Dunnigan, MD, a fellow in endocrinology at Parkland Hospital in Dallas. She was reelected alternate delegate to the AMA House of Delegates from the Residents and Fellows Section. Justin Bachman, MD, a cardiology fellow from the University of Texas Southwestern Medical School in Dallas, is the new chair-elect of the American Medical Association Resident and Fellow Section Governing Council. Congratulations, Dr. Bachman. Congratulations to four Texas medical students on their election as Region 3 delegates and alternates to the American Medical Association Medical Student Section House of Delegates. The two delegates are Neil Parikh and Archit Gulati, both from Baylor College of Medicine in Houston. The alternates are Jasmeet Kaur from the University of Texas Medical Branch at Galveston and David Savage, who is a student at the UT Houston School of Medicine. Shown below, left to right, are Ms. Kaur, Mr. Savage, Mr. Gulati and Mr. Parikh. "When I became president of TMA in May, I also became principal of the Health Reform School," Texas Medical Association President Sue Bailey, MD, told her colleagues at the Organization of State Medical Association Presidents (OSMAP) today. Dr. Bailey described the live and telephone conferences, the analyses, and the information pieces that TMA has used to educate thousands of members on the intricacies of the new health system reform law. "We used education, education, education," she said, "to bring our physicians to a place where they can survive, and perhaps thrive, in the new health care landscape." More than 1,000 physicians have attended the 13 free Reform School classes TMA has conducted so far in conjunction with county medical societies around the state. In addition to record attendance at some of these meetings, Dr. Bailey said the presentations "brought out doctors who had never been to a county medical society or TMA meeting before." Five more Reform School classes are already on the schedule. 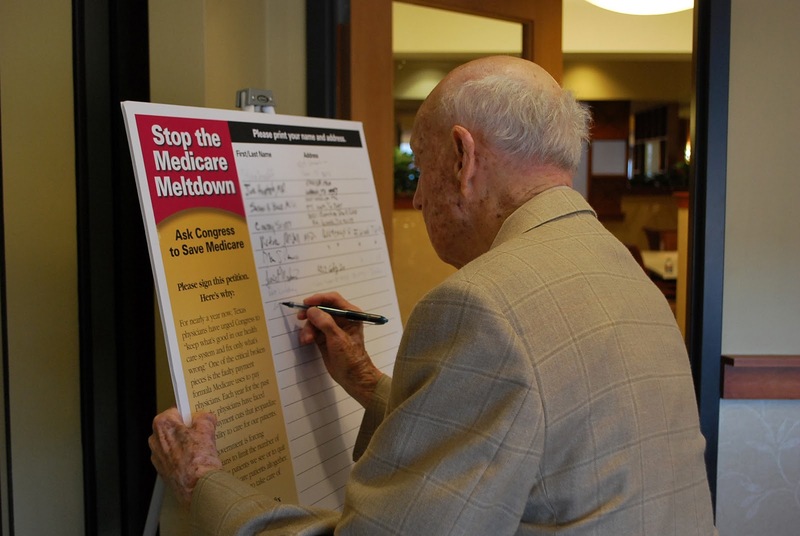 Physicians must decide their level of participation in the 2011 Medicare program by Dec. 31, even if Congress fails to stop the 23.5-percent cut scheduled for Dec. 1 or the 6.1-percent reduction slated for Jan. 1. The Texas Medical Association cannot tell you what to do, but it is offering some help in making a decision through a record Web seminar, Evaluating Your Medicare Options, on the TMA website. The one-hour webinar, featuring TMA's in-house Medicare specialists, provides detailed information about participation options and the consequences of those choices. It also offers one hour of continuing medical education credit.